"Sutton's Hospital" redirects here. For the 17th-century legal case, see Case of Sutton's Hospital. The London Charterhouse is a historic complex of buildings in Smithfield, London, dating back to the 14th century. It occupies land to the north of Charterhouse Square, and lies within the London Borough of Islington. The Charterhouse began as (and takes its name from) a Carthusian priory, founded in 1371 and dissolved in 1537. Substantial fragments remain from this monastic period, but the site was largely rebuilt after 1545 as a large courtyard house. Thus, today it "conveys a vivid impression of the type of large rambling 16th century mansion that once existed all round London". The Charterhouse was further altered and extended after 1611, when it became an almshouse and school, endowed by Thomas Sutton. The almshouse (a home for gentlemen pensioners) still occupies the site today under the name The Charterhouse; the school moved out in 1872 to Godalming, Surrey, where it survives as Charterhouse School (although its formal name does not include the word "school"). In 1348, Walter de Manny rented 13-acre (0.05 km2) of land in Spital Croft, north of Long Lane, from the Master and Brethren of St Bartholomew's Hospital for a graveyard and plague pit for victims of the Black Death. A chapel and hermitage were constructed, renamed New Church Haw; but in 1371 this land was granted for the foundation of the London Charterhouse, a Carthusian monastery. The twenty-five monks each had their own small building and garden. Thomas More came to the monastery for spiritual recuperation. The name is derived as an Anglicisation of La Grande Chartreuse, whose order founded the monastery. The monastery was closed in 1537, in the Dissolution of the Monasteries in the English Reformation. As it resisted dissolution the monastery was treated harshly: the Prior, John Houghton was hanged, drawn and quartered at Tyburn and ten monks were taken to the nearby Newgate Prison; nine of these men starved to death and the tenth was executed three years later at Tower Hill. They constitute the group known as the Carthusian Martyrs. For several years after the dissolution of the priory, members of the Bassano family of instrument makers were amongst the tenants of the former monks' cells, whilst Henry VIII stored hunting equipment in the church. But, in 1545, the entire site was bought by Sir Edward (later Lord) North (c. 1496–1564), who transformed the complex into a luxurious mansion house. North demolished the church and built the Great Hall and adjoining Great Chamber. In 1558, during North's occupancy, Queen Elizabeth I used the house during the preparations for her coronation. Following North's death, the property was purchased by Thomas Howard, 4th Duke of Norfolk, who renamed it Howard House. In 1570, following his imprisonment in the Tower of London for scheming to marry Mary, Queen of Scots, Norfolk was placed under house arrest at the Charterhouse. He occupied his time by embellishing the house, and built a long terrace in the garden (which survives as the "Norfolk Cloister") leading to a tennis court. In 1571, Norfolk's involvement in the Ridolfi plot was exposed after a ciphered letter from Mary, Queen of Scots was discovered under a doormat in the house; he was executed the following year. The property passed to Norfolk's son, Thomas Howard, 1st Earl of Suffolk. During his occupancy, James I held court there on his first entrance into London in 1603. In May 1611 it came into the hands of Thomas Sutton (1532–1611) of Knaith, Lincolnshire. He was appointed Master of Ordnance in Northern Parts, and acquired a fortune by the discovery of coal on two estates which he had leased near Newcastle upon Tyne, and later, upon moving to London, he carried on a commercial career. Before he died on 12 December of that year, he endowed a hospital on the site of the Charterhouse, calling it the Hospital of King James; and in his will he bequeathed money to maintain a chapel, hospital (almshouse) and school. In the Case of Sutton's Hospital, his will was hotly contested but upheld in court, meaning the foundation was constituted to afford a home for eighty male pensioners ("gentlemen by descent and in poverty, soldiers that have borne arms by sea or land, merchants decayed by piracy or shipwreck, or servants in household to the King or Queens Majesty"), and to educate forty boys. 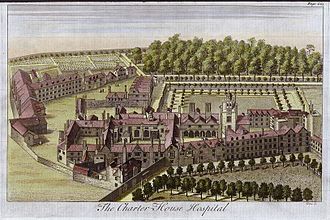 Charterhouse early established a reputation for excellence in hospital care and treatment, thanks in part to Henry Levett, M.D., an Oxford graduate who joined the school as physician in 1712. Levett was widely esteemed for his medical writings, including an early tract on the treatment of smallpox. He was buried in Charterhouse Chapel, and his widow married Andrew Tooke, the master of Charterhouse. The school, Charterhouse School, developed beyond the original intentions of its founder, to become a well-regarded public school. In 1872, under the headmastership of Rev. William Haig Brown, the school moved to new buildings in the parish of Godalming in Surrey, opening on 18 June. Following the departure of Charterhouse School, its buildings, on the site of the former monastic great cloister, were taken over by Merchant Taylors' School, until that moved out in turn in 1933 to a new site near Northwood, Hertfordshire. The school buildings then became home to the St Bartholomew's Hospital Medical School, and (though now much redeveloped) remain one of the sites occupied by its successor, Barts and The London School of Medicine and Dentistry. The main part of the cloister garth continues to be a well-tended site mostly laid to lawn in the quadrangle of the university site. The principal historic buildings of the Charterhouse were severely damaged by enemy action in May 1941, during the Blitz. They were sensitively restored between 1950 and 1959 under the direction of the architects John Seely and Paul Paget, an exercise which allowed the exposure and embellishment of some medieval and much 16th- and 17th-century fabric that had previously been concealed or obscured. In preparation for and in conjunction with the restoration project, archaeological investigations were carried out by W. F. Grimes, which led to a greatly enhanced understanding of the layout of the monastic buildings, and the discovery of the remains of Walter de Manny, the founder, buried in a lead coffin before the high altar of the monastic chapel. These remains were identified as Manny's beyond reasonable doubt by the presence in the coffin of a lead bulla (seal) of Pope Clement VI: in 1351 Clement had granted Manny a licence to select his own deathbed confessor, a document that would have been issued with just such a bulla attached. Charterhouse continues to serve as an almshouse to 40 male pensioners, known as Brothers, who are in need of financial and companionship support. The complex is open for pre-booked guided tours; and the chapel can be viewed as part of the annual Open House London event. In partnership with the Museum of London the Charterhouse has opened up the site to the public. There are three key elements to the project: a new museum, which tells the story of the Charterhouse from the Black Death to the present day; a Learning Room and Learning Programme so that school groups can discover how the Charterhouse has been home to everyone from monks and monarchs to schoolboys and Brothers; and a newly landscaped Charterhouse Square open to the public so that more people can enjoy the green surroundings. Works for this project were completed and opened to the public in January 2017. Guided tours are available. Charterhouse was considered to be an extra-parochial area and was not incorporated or included in a district of parishes by the Metropolis Management Act 1855. In 1858, following the Extra-Parochial Places Act 1857, it effectively became a civil parish for all purposes, with the provision that it would not form part of any poor law union. It was later added to the Holborn union in 1877. In 1900 it became part of the Metropolitan Borough of Finsbury, and was abolished as a separate civil parish in 1915. Since 1965 it has been part of the London Borough of Islington in Greater London. The nearest tube station is Barbican but Farringdon tube and surface rail station is also close. List of Masters of Charterhouse since 1611. 1624–37: Sir Robert Dallington, M.A. 1842–70: William Hale Hale, M.A. 1897–1907: William Haig Brown, LL.D. 1907–08: George Edward Jelf, D.D. 1908–27: Gerald Stanley Davies, M.A. ^ a b c Cherry, Bridget; Pevsner, Nikolaus (1998). London 4: North. The Buildings of England. London: Penguin. pp. 614–20. ISBN 0-14-071049-3. ^ Lasocki, David (1985). "The Anglo-Venetian Bassano family as instrument makers and repairers". Galpin Society Journal. 38: 112–32. ^ "Queen Elizabeth I at the Charterhouse". The Charterhouse. 28 November 2017. Retrieved 6 July 2018. ^ Nichols, John (1828). "The Progresses, Processions, and Magnificent Festivities of King James the First". J. B. Nichols. p. 114. ^ a b "Sutton's Hospital". Charterhouse. Retrieved 6 July 2018. ^ Banerjee, Jacqueline. "Charterhouse". Victorian Web. Retrieved 6 July 2018. ^ "The Company's Role in Education". The Merchant Taylors' Company. Retrieved 6 July 2018. ^ "St Bartholomew's Medical College Green". London Gardens Online. Retrieved 6 July 2018. ^ Knowles and Grimes 1954, esp. pp. 48–49, 87–92. ^ "Joining the Community". The Charterhouse. Retrieved 6 July 2018. ^ a b "Revealing the Charterhouse - the Charterhouse". Retrieved 18 September 2015. ^ Webb, Sidney; Webb, Beatrice (1910). "English Poor Law Policy". Longmans, Green & Co. p. 228. ^ "The Charterhouse". Islington Directory. Retrieved 6 July 2018. ^ "Visit us". The Charterhouse. Retrieved 6 July 2018. ^ Roper 1847, pp. 112–3. ^ Davies 1922, p. 349. ^ Porter 2009, pp. 133–4. Barrett, Charles (1895). Charterhouse, 1611–1895: in pen and ink. London: Bliss & Co.
Davies, Gerald S. (1922). Charterhouse in London: monastery, mansion, hospital, school. London: John Murray. Knowles, David; Grimes, W. F. (1954). Charterhouse: the medieval foundation in the light of recent discoveries. London: Longmans, Green & Co.
Oswald, Arthur (1959). The London Charterhouse Restored. [London]: Country Life. Porter, Stephen (2009). The London Charterhouse: a history of Thomas Sutton's Charity. Stroud: Amberley. ISBN 9781848680906. R[oper], W. J. D. (1847). Chronicles of Charter-House. London. Ross, Cathy, ed. (2016). Revealing the Charterhouse: the making of a London landmark. London: Giles. ISBN 978-1-907804-98-4. Temple, Philip (2010). The Charterhouse. Survey of London Monographs. 18. New Haven, Conn.: Yale University Press. ISBN 9780300167221. Wikimedia Commons has media related to London Charterhouse.